Trade Fair supermarket stretches along 30th Ave between 31st and 29th Streets. It’s a swath of color with its fruit and vegetables on display and bright announcements of special offers. 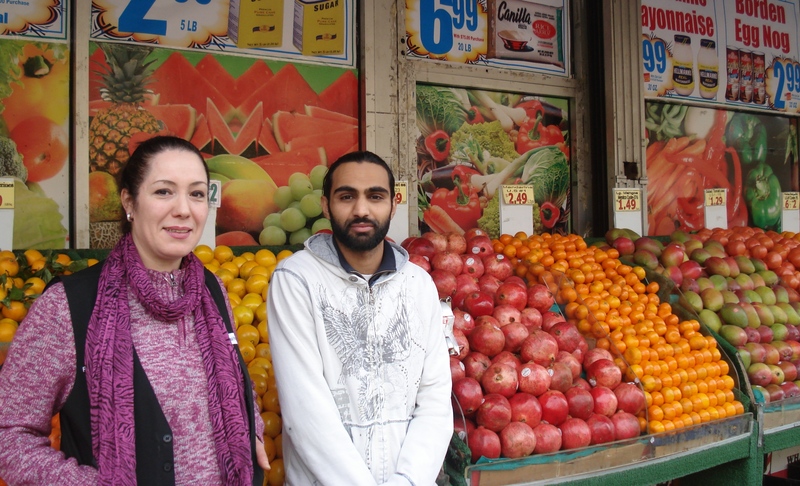 Among the bustle of customers and deliveries I spoke with its manager Mustafa Eid. Sabah Guessar, also a manager there, joined in some of the conversation too, coming back and forth from her work. The most challenging part of Mustafa’s job is “making sure that every product that a customer asks for is on the shelf. If someone requests something I look it up my book and try to find it and get it for them.” The 110-120 staff at the store speak many languages between them. Trade Fair advertises positions in the local Spanish, Arabic and other newspapers as well as online to make sure the team reflects the diversity of the customers. Prior to coming to the 30th Ave location he worked at the Trade Fair store in Ditmars. “It’s very similar to 30th Avenue but not as exciting actually. Over here is more diverse, much more diverse.” He describes Ditmars as Astoria’s “quieter version”. Mustafa’s hours are open. “I don’t even have a schedule. Whenever I get the chance to stay here I stay here, no matter how long it takes. I can be here between nine to 16 hours.” The store is open 24 hours and remains busy through to 2am. 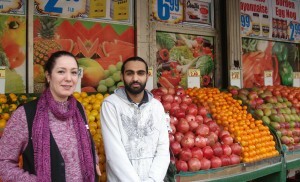 Sabah and Mustafa say that they get to know all their customers. “If a customer disappears for 2-3 days it’s like ‘what happened, we didn’t see you for a while?” says Sabah. Frank DePaola was born in Calabria, Italy and moved to the US when he was eight years old. His family first lived in Long Island before coming to Astoria. Thirty three years ago he opened Sorriso Salumeria, an Italian delicatessen at 44-16 30th Ave. “Sorriso” means smile in Italian. “We specialize in hard-to-get items,” Frank says. “Cheese, fresh-baked breads, sausages, meats, whatever you need.” His favorite product from the store is their mozzarella, which they make fresh every hour. The store also sells pasta and pasta sauces, prepared foods like lasagna and meatballs, and it does catering for parties. At the moment with Christmas approaching the ceiling is laden with hanging Panettone cakes. Frank says Astoria’s Italian community is smaller than it used to be. Some have “gotten older, they’ve moved away, some went back to Italy, they left us…” But at the same time, some of the original generation’s children and even grandchildren are still in the neighborhood, and still frequent Sorriso’s. “We also have an influx of younger people moving into the neighborhood – 25-35 years old, young professionals. They know good food, they love good food, and they know what to expect when they come in to buy something.” They also use the internet to track down what they want, Frank adds. 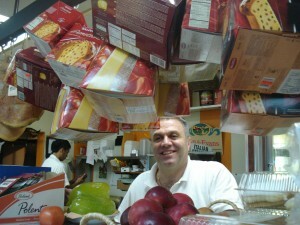 Technology also means that the hard-to-get products that Sorriso’s specializes in are now less hard-to-get. “It’s easier to get stuff from Europe than it was 10 years ago. Everything is computerized…it doesn’t take as long to approve labels and everything. 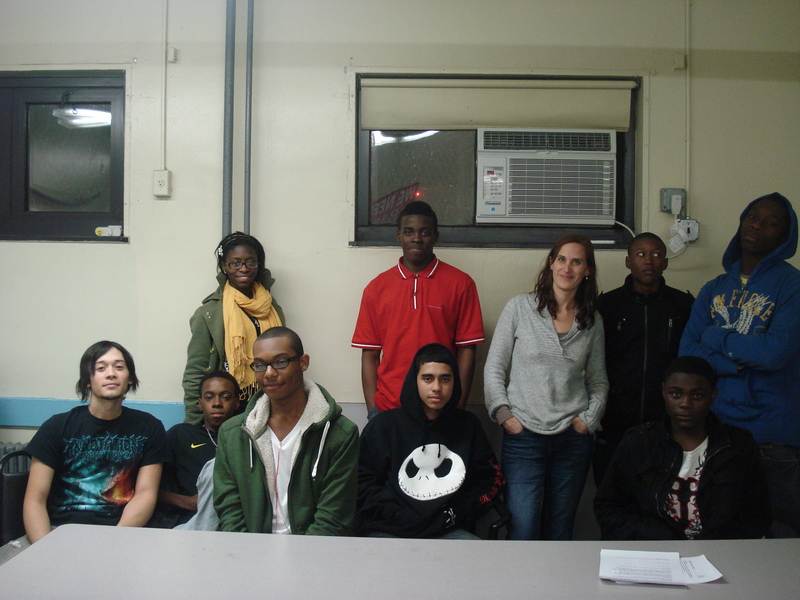 On Friday evenings a group of young people meets at the East River Development Alliance (ERDA) center in Astoria Houses, a housing development at the far Western end of 30th Ave that is home to just over 3000 residents. 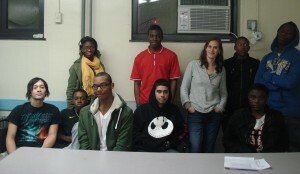 They meet to work on their project “REELization Films.” They make short films inspired by elements of their lives and issues close to home: one of their recent films was about teacher layoffs. I interviewed a group of REELization participants. I spoke with Artie Sanchez who lives in Astoria Houses, his cousin John Acevedo who lives in Brooklyn, Dashawn Wilson who now lives in Ravenswood and previously lived in Astoria, Dashawn Johnson of Astoria Houses, Mathew Lisbon and Duvall Ledbetter. Also participating were Efia Lewis, a student at Queens College who works as an intern with ERDA, and Sarah Montgomery, ERDA College Access Coordinator. He says that when he moved to Astoria Houses from Brooklyn at around the age of six, within a year he had a big network of friends. “Everyone gets to know each other,” he says. But he adds: “the bad thing about the neighborhood is that there are always problems here or there.” Towards the end of October, shootings at Astoria House escalated; in some incidents property was damaged and in two, people were hit by the bullets. He describes how the police appeared only after the second or third day. He says it felt a little safer with them there “because they were everywhere,” but that they had waited too long to appear. The police presence is minimal again now, with a van stationed outside the entrance to Astoria Houses. On whether they want to stay in New York City in the future, the members of the group all have different feelings. “I wouldn’t like to stay in New York because I’ve lived here for so long,” says John. “The city’s always alive. But sometimes when I’m in the center of Manhattan I go crazy. You don’t know what to expect. It’s like everybody’s in a rush, everybody’s doing so many different things, you see so many lights, it’s like, ‘do I want to do this?’/ ‘do I want to do that?’, you see something happening over there, you pay attention then something’s happening over here…you get confused sometimes. Just down from where I live on 30th Drive (a couple of blocks South of 30th Ave) is the mosque Masjid Al Ikhlas. At intervals throughout the day there is a greater flow of people down the street as people walk to, and then back from, their prayers. 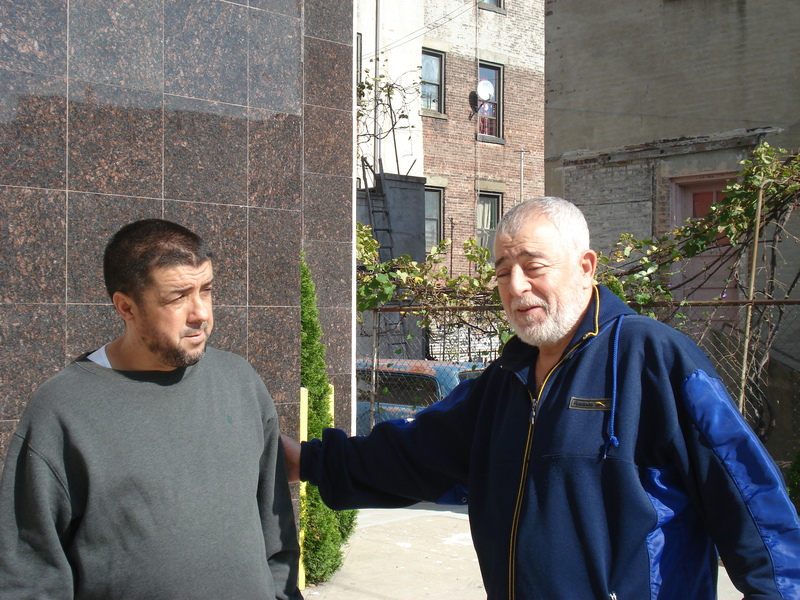 I spoke with Rahim and Akim, both from Algeria, outside the mosque just after prayers in the middle of the day. Akim has lived in Astoria for 22 years. He drives a yellow cab, which he says he does not enjoy but “it’s a living you know”. The two are friends, but had seen each other at the mosque that day for the first time in a while. And when they are not close to a mosque, “you can pray anywhere, in a park, a house, a restaurant, wherever you are,” says Rahim. Akim adds: “The group prayer is important though. Praying in a group at a mosque, the rewards are bigger than doing it by yourself.” He describes it as collecting more points, which will serve you well at the end of your life. Both of them were here when the 9/11 attacks happened, and also saw the way in which the Muslim community was targeted during the period afterwards. “There’s bad and good all over,” says Rahim. “If you take the case of Timothy McVeigh in Oklahoma, he was not a Muslim. Sometimes what you notice is if something is caused by a Muslim they go after everyone, put more pressure. But if it’s someone from another religion, they say ok, that particular guy did it – they don’t say Christians did it, they say Timothy McVeigh did it. But if a Muslim did it they say Muslims did it. So they were generalizing, taking advantage of it. That’s what we feel.